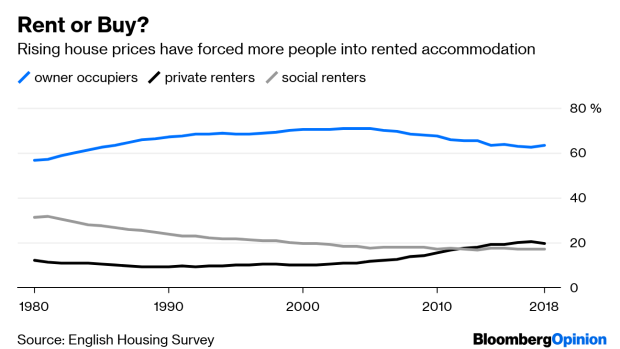 (Bloomberg Opinion) -- In the 1980s, Margaret Thatcher’s Conservative government deregulated private rented housing in the U.K. and gave tenants the right to buy local authority homes at a discount. Her “property-owning democracy” was intended to give people more autonomy and to build up wealth – a noble aim. Happily for her, it also created a new generation of Tory voters. A proposal this week from Britain’s latest Conservative government, to prevent English landlords from evicting tenants without cause, marks the latest break with Thatcher’s tradition. And not before time. The country’s property market has become disastrously biased toward asset owners, and renters need more security. In the U.K., as elsewhere, young middle class families – the kind of voters that historically voted Conservative – have been unable to buy property because of soaring prices. Overall, about one-fifth of England’s households now rent privately, double the level at the turn of the millennium. Hence, the government (both that of Theresa May and her predecessor David Cameron) has become increasingly interventionist on housing, although not always effectively. First, it tried home-purchase subsidies (which succeeded most in pushing up house prices) and then it started reining in tax advantages for buy-to-let landlords to try to free up more housing stock for buyers. More recently, the government has turned its attention to treating renters fairly. Before this week’s proposal on curbing evictions, it had already scrapped the payment of real estate agent fees by tenants. The U.K. still has a long way to go. In Germany, where I live, home ownership rates are much lower and tenants enjoy far greater protection. Rental contracts are usually open-ended and the landlord can only evict the tenant in a limited set of circumstances; for example, if they want to occupy the property themselves. (When I first lived in Germany more than a decade ago, people didn’t talk about house prices all the time as they do in Britain – although sadly that’s begun to change). In contrast, most English tenants have short-term contracts and, under a rule known as Section 21, they can be evicted with as little as eight weeks’ notice after an initial grace period. Tenancies are still mostly ended by the renter, but one survey of English households found that 10 percent of renters who’d moved in the last three years did so because their landlord asked them to leave. And these numbers don’t tell you what it feels like to live with the threat of eviction hanging over you. Tenants are often afraid to challenge landlords about a shoddy property or rent increases. Eviction can have huge financial and social consequences: Moving is expensive and it may be impossible to find a home in the same area, meaning children may have to change school. Thousands of families therefore choose to suffer in silence. Of course, most landlords aren’t Dickensian monsters bent on bleeding vulnerable people of every last cent. Property owners usually recognize the benefits of being on friendly terms with reliable, long-term tenants. And landlords rightly feel aggrieved when the courts take too long to hear cases of damage by renters or non-payments. Scrapping no-fault evictions won’t be a panacea for Britain’s struggling renters either. How could it be? For starters, it does nothing to tackle Britain’s paucity of social housing, which is one reason the private rental market is under such strain and why rents are so high. Nor will the increase in regulation encourage owners of second properties to let them out, or private investors to build more homes – something the U.K. needs desperately. If the government really wants to help tenants, it would probably need to go further by regulating rent increases too – something that Jeremy Corbyn’s Labour Party has promised to do, but which would be politically and economically far more controversial. Even then, tenants would remain vulnerable. Germany has plenty of regulations restricting such rises, but the explosion in rents in my home city of Berlin shows how easily the rules are flouted. Ultimately, renters will be disadvantaged so long as a wall of money continues to bid up the price of houses and we don’t build enough of them. But at least Britain, that most liberal of market economies, is finally starting to recognize the problem. Over the past three decades, the U.K. has been obsessed with turning homes into a financial asset. That’s been wonderful for asset-owners but less so for everyone else. First and foremost, houses are a place for someone to live. Their name might not be on the title deed, but tenants should be able to think of it as their long-term home.